The Little Tokyo Koban’s Autumn fundraiser is a must-see for everyone in the Japanese and Japanese-American community. “Nihonmachi: The Place to Be” is a musical performance by the Grateful Crane Ensemble that depicts the history of Japantowns in North America, and is one family's story. December 7, 1941 occurs and their lives are disrupted; as the result of EO9066 and are sent to “camp”. Upon their release, they return to rebuild their lives and their families. “Nihonmachi” is the story of a third-generation manju maker who decides to close his 99 year-old store, opened by his grandfather. After coming to that decision, the spirit of his deceased grandfather comes to show him the Nihonmachi of the old days. Songs made popular by Japan’s revered Misora Hibari will be performed, as well as of the various periods in America (war time, 60's, and the 70's). 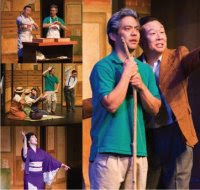 The story is loosely based on the family of Seiichi Kito, who opened Fugetsu-do Confectionery in 1903 in Little Tokyo. The 106-year-old shop is presently owned and operated by grandson, Brian, who is the Koban’s current President.